Welcome to Schieferdach.net – Your professional slater from Eslohe in Germany! Without question, the slate roof is one of the most beautiful views of roof construction. 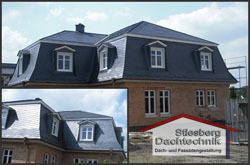 A slate covering is the optimal solution for every roof and every facade due to individual processing options. Slate is one of the oldest building materials and was already used in the stone age for roofing. Due to the economic recovery after World War II slate was replaced throughout Europe by cheaper industrial products. The natural stone (more precisely: sedimentary rocks) is, in addition to its flexible processing, water resistant and weather resistant. Slate covering has a lifespan of approximately 80 to 150 years – depending on its quality also far beyond. In comparison, a conventional roof “survives” about 40 years only – also depends on the quality. The amortization of a slate covering is therewith obvious. In the long term it is the economically better solution. Also the combination with roof insulation and thermal insulation of the facade is no problem at all. Just ask us for an individual offer and check out some of our previous references.